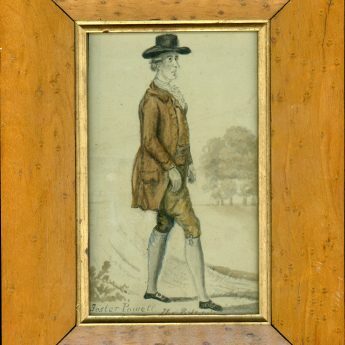 The forerunner to racewalking, the sport of pedestrianism was first recorded during the eighteenth century, Captain Barclay, Foster Powell and George Wilson being amongst the first sportsmen to compete usually for wagers. This watercolour portrait portrays Foster Powell in action. He is notably dressed as a gentleman in a frilled chemise under a frock coat, matching waistcoat and breeches, along with a fashionable round hat with its broad brim and low crown. One of the earliest published records of pedestrian performance [Particulars of the late Mr F. Powell’s journey on foot … London: 1772] relates how in 1772, for a wager of 20 guineas, Foster Powell set out to walk the 40 odd miles from London to York and back within six days, setting out from London at 00:20 on Sunday 29 November 1772, he arrived back at 18:30 the following Saturday. The account records that “at York, he delivered a letter to Mr Clarke, a watchmaker, and then went to the Golden Anchor where he took some refreshment, then went to bed for an hour and a half, after which, at half past five, he set out on his return …”. 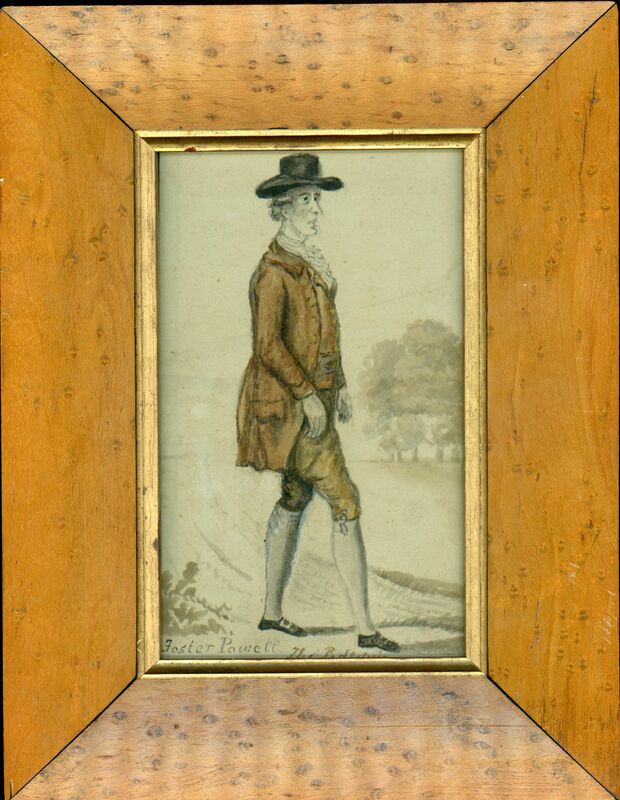 Born near Leeds in 1734, Foster Powell became articled to an attorney in the Temple in 1762. 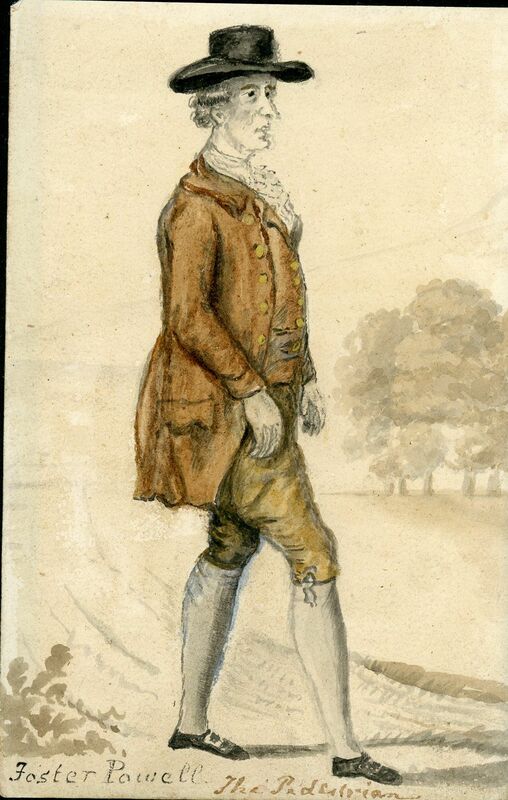 His first recorded pedestrian exploit occurred in 1764 when he covered 50 miles on the Bath Road inside seven hours. Forays over long distances in Switzerland and France followed, before the first of his four London to York return trips took place in 1772. Foster was described as “tall and thin, … very strong downwards, well calculated for walking, and of rather sallow complexion”. His death in April 1793 was well recorded. Watercolour on paper laid of card, it is set in a handsomely-figured bird’s eye maple veneer frame with a gilt slip.